When the iPhone 5 launched Apple promised availability in 100 countries before the end of year. This was a very aggressive plan given the gradual release of previous products. Last year the iPhone 4S only arrived in China (along with 21 additional countries) on January 13th. This year it was almost a month earlier. 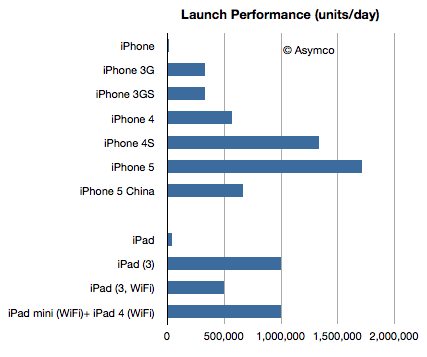 Apple also announced for the first time this year first weekend sales for China: 2 million. This is, as far as I know, the first weekend sales data for a single market outside of the US. The time span was three days and therefore the daily sales rate was 2/3 million per day.